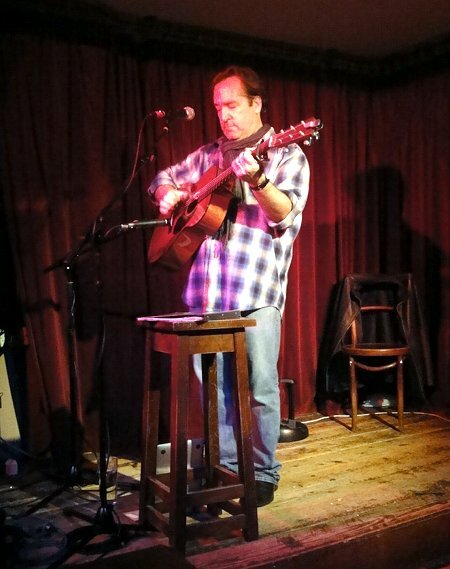 Here’s a review of Richard Shindell‘s early show at the Green Note in London, November 20th, 2011 (abbridged version of my post on the Shindell List). There was a window in the roof, so the stage actually faced towards daylight. Richard pretended to be annoyed when he came on stage and remarked that he was practically a vampire. “Fishing” isn’t the happiest song in the universe, so the lack of visual gloom didn’t really matter. Richard talked a lot between songs. He told the story behind the guitar (from 1931, which he had bought from Stephen Bruton) in “Your Guitar”, a new song that has a somber feeling, sort of the atmosphere of “Abuelita” mixed with the rhythm of “State of the Union”. Some of the harmonies are pure gold. “Deer on the Parkway”, another new song, followed. He elaborated on the story of the original title (“Deer on the Saw Mill”) and that he didn’t like the implication: “Just… gore.” It sounds a bit like atmosphere of “Calling the Moon” mixed with the rhythm of “Parasol Ants”. I’m looking forward to hear a fully produced version. “Abuelita” was the first real surprise. I really like how (so far) every Richard Shindell concert I attended featured a couple of songs I haven’t heard live before. I’m also fascinated that there appears to be a healthy mix of all studio albums in Richard’s setlists. In “Transit” he sang “Democrats and Republicans; but mainly Republicans”, which drew some laughter. The audience was “civil”, yet the closeness kept everybody attentive. “Get Up Clara” was groovy with its intricate finger picking and the dark atmosphere. In the middle part he inserted a talking bit that went like: “Here should be a bridge; but it would have to be an aqueduct.” He then promoted his “new” album, “Thirteen Songs You, Or May Not Have Heard Before”. He went on a detour about how it is not (yet) available in the U.S. – and how in the 80s people had always “gone to the UK” and then reappeared as rock stars. He translated this situation to his career in a hilarious way, saying that he’s hoping to raise his hipness factor by having a U.K.-only album – at least for another week before the U.S. release. There was another unexpected song: “Canciòn Sencilla”. Once again, Richard spent almost as much time telling the story behind the lyrics as he spent playing the actual song. Did I mention that Richard was singing and playing fantastically? He took his time tuning and re-tuning his guitar, but apart from it was a great performance, technically flawless and still really intense. Between “Arrowhead” and “Reunion Hill” he recounted his encounters with civil war reenactors (that are attracted by his war songs) and how they asked him what kind of underwear the characters in his songs would have worn. Unlike the humorous chatter between songs, the actual song (“Reunion Hill”) was just sublime – so hauntingly beautiful! The encore was yet another surprise: “Mariana’s Table”, Richard’s favourite song off “Not Far Now”. He described his new home in Argentina at great length, suggesting that the seemingly endless pampa there would cause “horizontal vertigo”.